For most people, 3-days after Thanksgiving is about the time they can't imagine eating another bite of turkey. 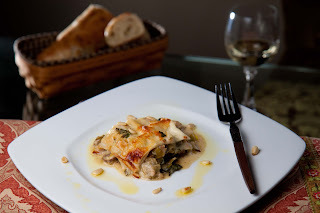 They clearly have not tried my white lasagna with oozing, cheesy buttermilk sauce and fresh pasta filled with layers of leeks, mushrooms, spinach and turkey. The cheesy, garlicky buttermilk sauce is not my healthiest sauce ever, but man is it good. The perfect backdrop to the turkey and leek filling. One bite and the last thing on your mind will be turkey leftovers - trust me! Even if you purchase the lasagna sheets rather than make the pasta from scratch, this lasagna will have everyone begging for more Fat and Happy leftovers. We host two annual parties every Thanksgiving holiday, the first is an elaborate dinner featuring something like Turducken, Cornish game hens or beef tenderloin in a port reduction sauce. The second is a Left-Over's Party in which everyone brings left overs from their holiday dinner and we create new recipes out of the old. The LO party is about food, but also to let everyone have a relaxing day with friends before heading back to the grind. Elaborate recipes sit on the back burner to make room for more simple, rustic creations. Most of those recipes never make the blog because it's not the time for photos or accurate note taking. 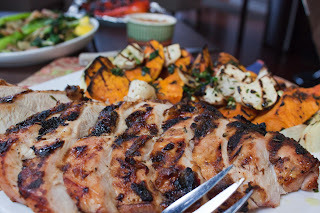 One year we ended up with an extra turkey for this party so I cut it into large sections (to save time) and grilled it. An apple jalapeno glaze was created from left over hot apple cider; it was a huge hit as the spicy pepper played on the sweet apple and juicy turkey. I decided to recreate this dish for the blog because it's a perfect crowd-pleaser for Holiday festivities; this works a simple dinner as well. If there is any left over turkey, it's fantastic on sandwiches. Annual party, Holiday dinner or Sunday tail gating - it's turkey time and Fat and Happy has the recipe for you. Potatoes are ridiculously versatile; I believe there is something like one-million potato recipes out there...and growing! 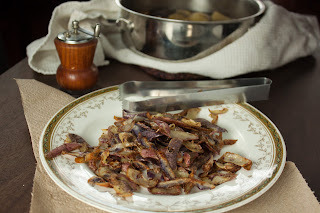 While making mashed potatoes today I happened to create these super yummy, crispy potato skins. Often I'll use the skins in my mashed potatoes for a rustic effect but this time a more refined result was required. The mixture of red, purple and white potatoes created a pretty pile of raw skins that starred at me begging for some love. A little butter and seasoning and you've got a new option in place of hash browns at breakfast, instead of fries or chips with a burger or a fun side to a steak. I'm quite sure a little dollop of sour cream would be extra delicious. Whether to call them skin fries, or skin browns or crispy potato skins is the least of my worries. I need to come up with more reasons to use the inside of the potato so I can have more fat and happy skins to cook up! Cool fall weather just screams for soup - and squash is a classic choice. Sometimes soup doesn't feel like it's a full meal so I wanted to add a little something to it. These stuffed onions make use of lots of the fall vegetables and give the soup a little life. The hardest part of this is creating the onion bowl, but if you look close at the photos, there is a slit in one side of them. After cleaning the onion, slice off the ends and make one small slice starting at the top through to bottom, from the middle of the onion out. Then peel the layers apart; this will form a big ring or bowl with a hole in the bottom. Lay a piece of the Swiss chard inside the bottom of the onions to form a loose bottom. This sounds like a lot of work, but it comes together pretty easily. Make it a day ahead of time through stuffing the onions and hold in the fridge. Then place the whole thing in the oven (I suggest letting it come to room temperature first) and continue from there. You'll have a fat and happy fall dinner in no time! I first created this ice cream as part of a Thanksgiving dinner last year. It was such a hit that I sent home all the extras with our guests and forgot to get pictures of it. Oh darn, that meant I needed to remake it ... for photo purposes, of course. The texture of this ice cream is slightly different than all the rest of my ice creams, while the base is still extraordinarily creamy, it's studded with a fine layer of tiny, crunchy, toasted macadamia nuts. As it begins to warm and melt it doesn't become runny milk as typical, it becomes almost foamy thanks to the texture. The result is a hearty, toasted flavor that the fills the palette with joy. 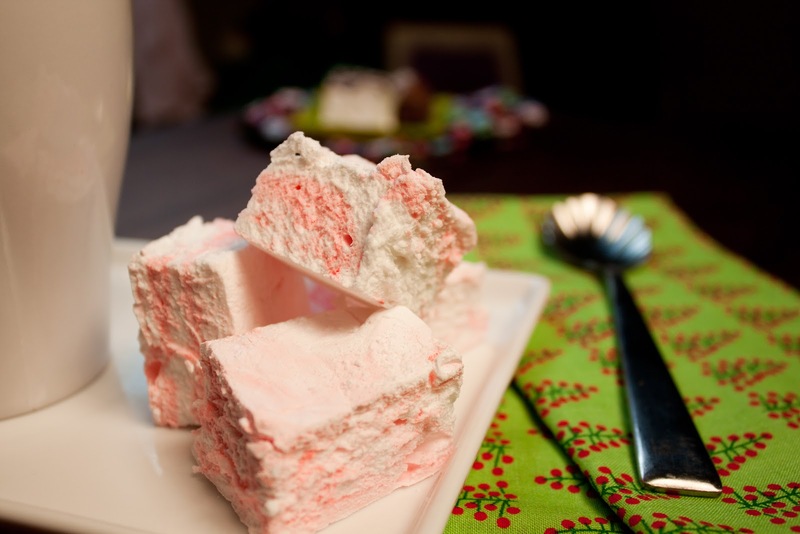 The hint of white chocolate gives this ice cream a sweet holiday undertone. This ice cream feels like a fall or winter treat, but paired with the right thing and with the right sauce (say nestled inside a delicate roasted peach), it could easily become a fat and happy summer dessert. Sometimes I get so caught up in trying to make completely new recipes that I forget about simple, classic dishes. 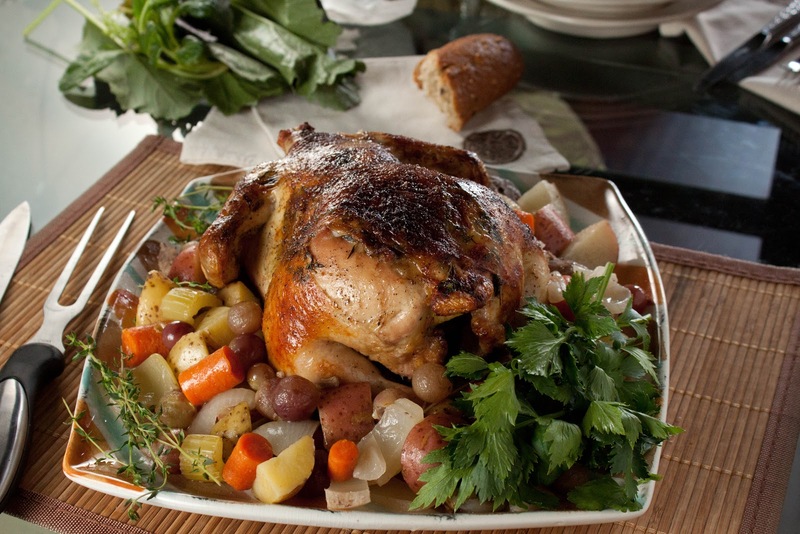 Take roasted chicken for example- one of the easiest and yet most satisfying dishes to make and eat. the crispy darkened skin comes out so picture perfect you can't stop picking at the edges for a nibble. the addition of champagne and grapes elevates it from a Sunday dinner to Saturday night dinner party status. Be sure to serve this with a big crusty bread to soak up the rich champagne sauce. It's comforting in that hearty, wholesome, chicken noodle soup sort of way. Whether it's for a lazy football afternoon or to impress your in-laws, this fat and happy champagne lemon roasted chicken is a can't miss. Yes, I've touted the benefits of these CSA (Community Supported Agriculture) delivery's many times this past summer but I'm not done. Opening the weekly box is like a Chopped show- you don't really know what is going to be inside or what you will make from it. This system forces many to go outside of the comfort zone and try new vegetables they normally wouldn't pick up. For instance, kohrabi. The taste and texture is similar to a crunchy broccoli stem with hint of overall cabbage, but fresher. My recipe below makes use of the freshness of two fall veggies for a simple salad and of the frozen basil in my freezer for a splash of summer. Half of this salad came to work with me the day after it was made, what I found was both the radish and kohlrabi softened as they soaked up the aioli and I loved it even more. Even if you aren't getting a vegetable delivery, fresh food is still doable. 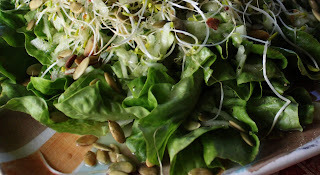 Start with this easy fat and happy salad then try experimenting from there. Macaroni and cheese. Mac and Cheese. Mac n cheese. Cheesy mac. Doesn't matter what you call it, we are talking about pasta in a cheesy sauce. It's hard to screw up, but there are hundreds of thousands of variations. This is a go to dish in our house and every time I make it, it ends up different based on available ingredients. 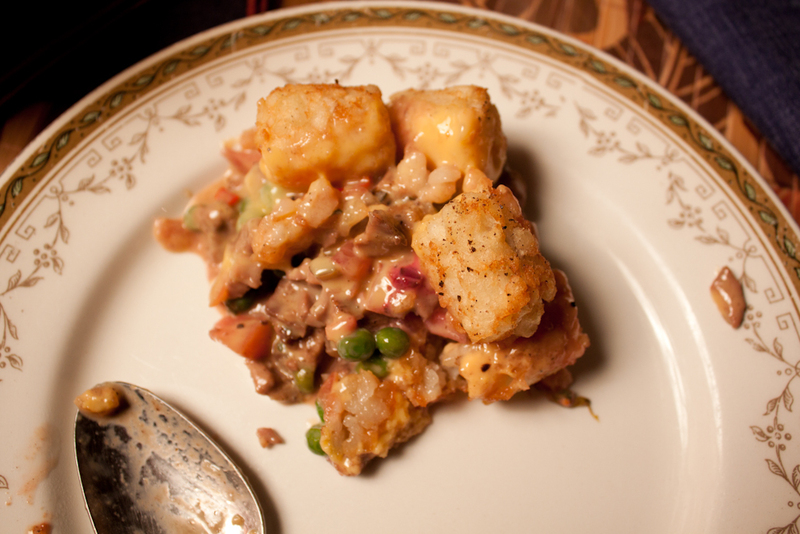 In this one, beer becomes a substitute for buttermilk and gruyere gave way to blue cheese. But without a lick of bread in the house for a crunchy topping, that's where I needed to get creative. All the makings of an avocado salad stared at me and I started to wonder how this would be in a cheesy macaroni? In a beer cheese macaroni? Bacon and tomato, sure that goes with pasta, cheese and beer. Avocado certainly works too. But could an avocado salad sit on top of mac & cheese? There was only one way to find out. There is something about this time of year - we all get completely possessed. I'm not talking about ghost and devils and Halloween, but rather pumpkins. Those tasty, crazy, fat, heavy, orange pumpkins - their vines wind right through our ears and overtake our brains resulting in pumpkin cravings for everything. Cookies, bread, martinis, facials and even pumpkin foot massages! I'm not one to fight the cravings but rather feed into them; so here is one more fat and happy pumpkin cookie recipe for you. Halloween is for the kids. Sure there are those times that we dressed up as adults and had fun. And even that time we spent money on renting the real Batman and Catwoman costume, invited over 200 hundred of our closest friends and then spent 2 days cleaning up after- good times. But the excitement and wonderment in the little eyes when they put on their first cape and make the ginormous jump from the couch to the floor- if only for a second, they really believe they are flying. It's that little wonderment that adults loose over time. Even the simplest decorations are fascinating when we are young. Enter the haystack critter. These deceivingly decadent, rich and tasty cookie-like-creatures are just the thing to add a teeny bit of interest back into Halloween. A no-bake spider cookie with four simple ingredients, stirred together and plopped down on paper. You strategically place a few candy pieces to form a face, legs, antenna, a nose or whatever (eating a couple of 'eyes' along the way) and then sit back and wait for the haystack to harden. Simple. Office mates love these too- you might find two of them battling it out with their alien-like monsters. Winner eats both! Put a little fat and happy back into your Halloween with Butterscotch and Peanut Butter Haystack Critters. The weather is absolutely gorgeous out right now; warm and sunny falls days with just the lightest hint of crisp air in the evenings. Summer plants are still producing the last of their wares as the golden leaves fall around them. Unlike the color white, summer salads and grilling is not only acceptable but encouraged! If only we could bottle this feeling and these flavors for those cold, dark, winter days ahead. Freezing fresh herbs puts us one step closer to the summer and fall feeling during the unavoidable Midwest blizzards. If you are growing your own herbs, or if you are participating in a CSA program or if you just have an overwhelming amount of basil that you don't know what to do with, this is your answer. Rather than force yourself to put basil in every single thing you make just to use it up - chop and freeze it for use weeks and months down the road. Plus it's completely the simplest thing you can make today. Dried herbs are great in a pinch and even better for longer cooking soups and stews, but why not use fresh every chance you can? Imagine fresh pesto in January! Take your remaining fresh basil and freeze it now, you'll be super fat and happy you did come this winter. Are you inundated with tomatoes? Have you made salads, sauces and salsas until they're coming out of your ears? Aside from bringing all your remaining tomatoes to the next bad comedy show you attend, a super simple tomato tart is a tasty option to use them up. 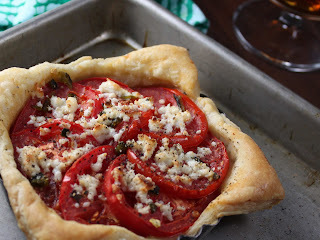 Frozen phyllo dough makes for a quick and easy crust while the filling is nothing more than cheese and tomatoes. Almost a mock pizza....if you will. These tarts work great as tapas with a little wine or pair with a salad for a light dinner or lunch. When you have super tasty tomatoes there is no reason to cover that flavor with other ingredients. Keep the cheese to a minimum and let the farm fresh tomato flavor shine through. Slow Food is not a new phrase in the culinary community, it's been around for some time. But only recently has this become a mainstay in the United States. An alternate to fast food and a means of enjoying and preserving traditional cuisines, this movement is more about food that is good for you and good for the environment than the method of cooking. The goal could summed up as to promote awareness of good food and nutrition. This recipe plays on all linguistic sides of Slow Food- it is using healthy, planet-friendly, local, organic food which would inspire a table side gathering as well as it describes the the manner to which the ingredients are cooked. 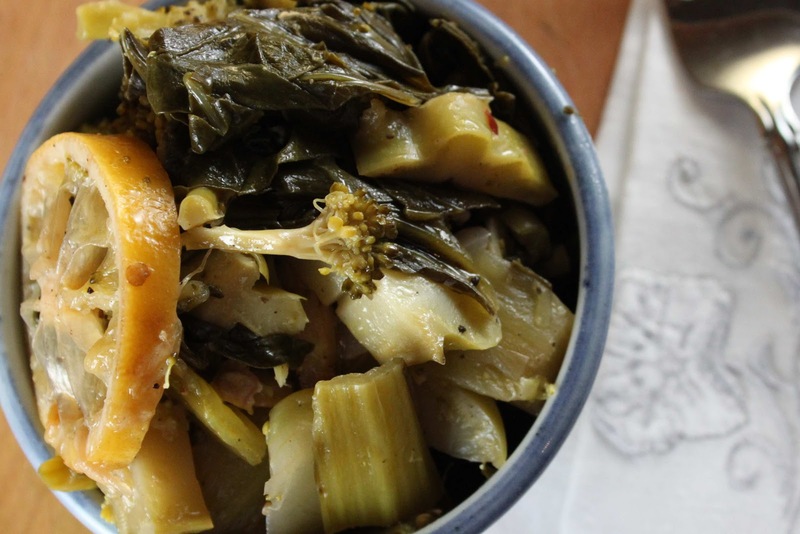 Reminiscent of collard greens, this dish makes me think of the south or of a rustic Italian farm; very warm and comforting on a lazy afternoon. The greens are soft and melt in your mouth rather than become mushy. And the garlic becomes a little treasure trove for the lucky bowls that land one of the smashed cloves, so mild and tender. But it is the hint of lemon with the red pepper cooked in the dish that envelopes the soft stems for a full flavor finish. Bring the family together with this ultra simple, healthy Slow Food Bok Choy dish. Time will stand still for one Fat and Happy moment. You can't beat a good old fashioned brownie. 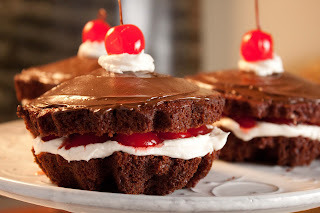 Unless you soak maraschino cherries in whiskey for a week and add them to the brownie batter along with a bit of Kahlua. Then, ZOW! POP! ZAP! You bite into what you think is a normal brownie, you anticipate the chocolate and you imagine this will be good. Before you even know what hit you, your taste buds are doing flips on your trampoline tongue and your hand is reaching for second helping before the brain has even processed it. This is a pretty classic brownie recipe, on its own it's unbelievably decadent and moist. But then you add in a glug of Kahlua and boozed-up cherries ... picture a cartoon where the eye balls pop out of the cats head. Yup, it's better than that. People say the photos don't do these justice- so my suggestion is you go right to the kitchen and start mixing up your own batch. Then CRASH!, BANG! and POW! your friends with this amazing Fat and Happy treat! Do you ever pick up old recipe books and read them? I love 'um! I love everything about them - the lack of direction, the casualness of the ingredient amounts and the expectation that you will just know things (like when they say: cook till done. Um, when?) Unlike any modern cookbook, there are no indexes to learn what an ingredient is, no explanation about the recipes and there are no pictures ether. And the truth is, I wouldn't want any. It would distract from the simplicity, not to mention kill the surprise of what some of the these dishes end up looking like! Fellow Food Blogger, Christianna, picked up one such book about a year ago and was inspired to challenge other foodies to recreate these recipes. So once each month we all eagerly await the email with an image from the old book telling us what the new dish is. Or, what it was. It's our job to put our own spin on it. 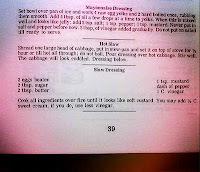 Hot Slaw is this months winning recipe; so many options with this. I have a page full of ideas. 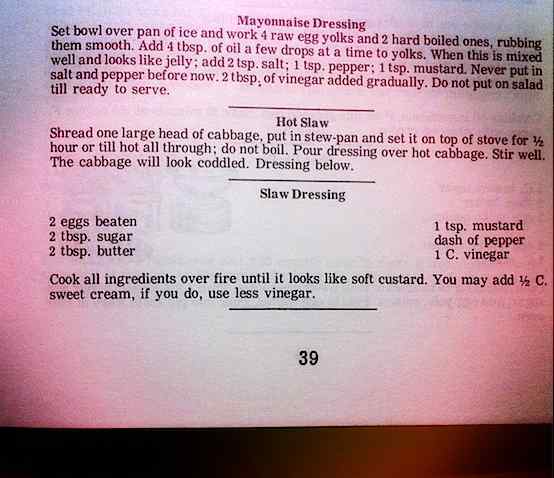 The hot dressing intrigued me the most, but I wanted to lighten it up. The versatility of cabbage makes it one of my favorites. The idea of this hot, tender cabbage with a creamy dressing pulled me in the direction of a creamy, caramelized soup. Simple, easy and could be recreated to be lighter on the hips. Think French onion soup meets spicy coleslaw. Mixing onions with fennel and cabbage, then sauteing until everything becomes a deep golden hue ... the final product almost gives off a hint of a smoky bacon. This easy cabbage soup turned out to be a testament of the simpler days when directions weren't needed. 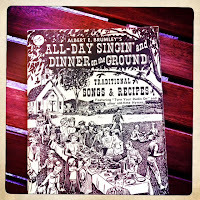 Cookbooks aren't just for cooking anymore, but they used to be! And this Fat and Happy Hot Slaw Soup will help you momentarily relive those days of lore. For a while I tried to tell people that bacon 'jumped the shark'. Everybody seemed to be diving on the bacon bandwagon head first- bacon popped up in drinks and chocolate chip cookies, bacon air fresheners were hanging at coworkers desks and bacon gum was offered after meals. I felt like people were intruding on my private bacon love fest and I didn't like it. So I turned to chorizo- which is spicy Spanish sausage and fun in its' own right. But the truth is, bacon is irreplaceable. The salty, smoky, sweet, crunchy, chewiness cannot be achieved with sausage, or turkey bacon and certainly not a tofu-bacon. So to add to the deluge of pork recipes, I'm sharing with you my classic pork wrapped bacon (is that an oxymoron?) The bacon seals in the pork and it comes out with finger licking, dripping down the arm juicy. Yes, there are times that sausage can suffice, and even be the right choice on occasion. But do not overlook the glorious under belly of the pig. And I'm here to tell you that bacon has not jumped anything... certainly not my fat and happy mouth! First there was the plain old shot of alcohol. Then came Jello shots. And now enters the pudding shot. Thick, creamy pudding mixed with alcohol for a tasty adult party favor. While intrigued when we first heard about these, I struggled with a full understanding of the flavor. Then we tried a chocolate pudding shot and WOW- it was a creamy, chocolatey, boozy sensation that called for more tastes! Two parties presented the perfect opportunities to try my hand at these punched-up pudding shots; a fundraiser and a going away party for a coworker. Sure the pudding shots may sound a bit out of place for a fundraiser, but it loosened the crowd for the live auction and turned into a super fun conversation starter. Jello shots are so old-school. When your next party calls for a shot of fun, step it up with boozy pudding shots for a Fat and Happy party boost. 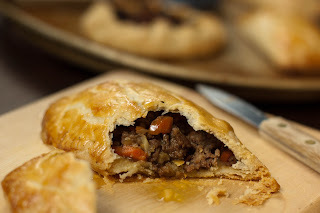 My good friend and fellow foodie Marianne helped create these - Thanks M.A.! If you need the extra protein, thinly sliced turkey meat from the deli would pair quite well with all the flavors and offer a slightly heartier option. Elevate your tortillas with cool-weather fruit, then pair this gooey, cheesy, messy quesadilla with a spinach and walnut salad for a tasty Fat and Happy meal. A box arrived the other day cradling my first fall beer of the season. Thinking about crisp autumn weather may not be on everyones mind just yet, but for the team at The Bruery, they've taken it off their minds and bottled it already. Autumn Maple is a bold, seasonal beer made from a traditional Belgian style strain. Brewed with yams (instead of pumpkins) this beer has a serious boozy punch. Ideas swarmed my head with potential recipes but the flavor of the beer led me down the pizza path. This easy crust recipe offers an earthy warmth to my classic Fat and Happy thin grilled flatbread. 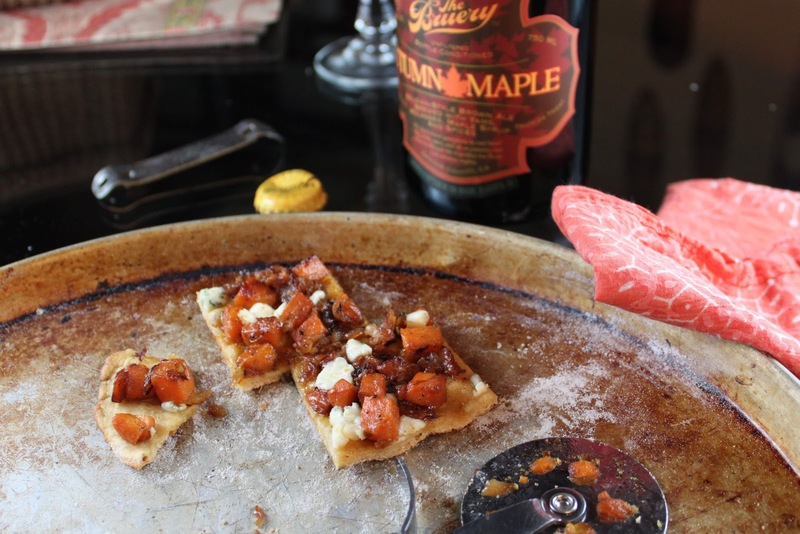 The tangy blue cheese sets off the creamy sweet potato and crisp pancetta. 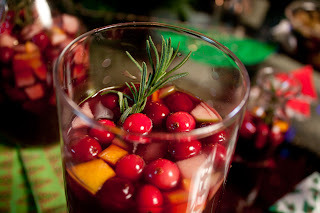 The whole concoction is a gorgeous fall mix with a yeasty beer overtone. When the cool winds arrive, warm from the inside out with a glass of Autumn Maple and a Fat and Happy Beer Pizza. Did you need to read that title twice? There's a lot going on in it- especially the beer in a curry sauce. But I do like to put my own slight twist on recipes; even more so when beer is involved! The Bruery sent me a few bottles of their Autumn Maple beer in exchange for a recipe as part of their Facebook Blogger Invitational - I was all too happy to play around with a new beer. This beer, which is brewed with yams, is their answer to the many pumpkin beers found on the market today. I found it to be a bold beer that is reminiscent of all things fall - bold, earthy and warming with a hint of spice and happily not too sweet. There are a lot of obvious pairings with fall beers, but I wanted to go just beyond the typical. 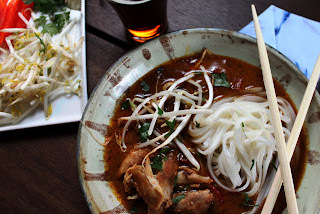 In this dish, coconut milk and red curry paste are an obvious combination as is the chicken and rice noodles. And often a dish like this would call for a fish sauce, but using a full-bodied fall beer helps to give this sauce an earthy undertone. Bring on the Autumn chill - I'm ready with a Fat and Happy warm fall dish that's slightly off the beaten path. It's the beginning of new month which means it's time for another Burwell General Store Recipe Swap. The recipe swaps started as a junk store book find. 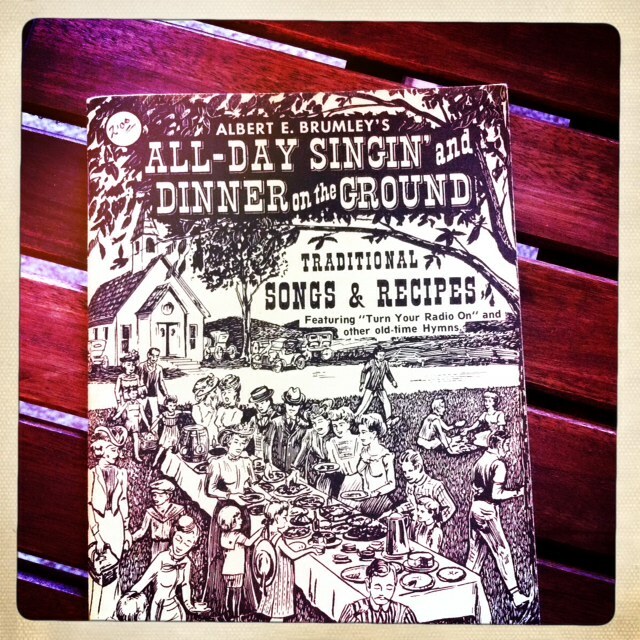 This book All-Day Singin' and Dinner on the Ground intrigued Christianna to redevelop these recipes into her own. The swap grew from there. I was excited about this months recipe: Wild Rabbit with Vegetables. This meant I needed to go rabbit hunting. And when I say rabbit hunting, I mean I biked over to the meat packing district in the West Loop of Chicago to purchase my rabbit out of the back door of an old warehouse. I did wear my camouflage pants to be in full rabbit-hunting spirits! With the fall season approaching I wanted to make something warm and hearty. 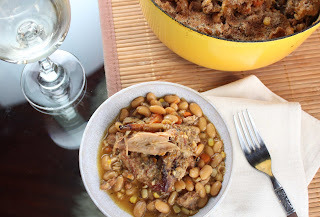 A cassoulet is similar to classic stew or casserole even, filled with rich slow cooked beans. The perfect welcome to the approaching cool season. If you haven't had rabbit before, it's tough to describe - it can resemble a tender yet wild chicken but so much better. When prepared in this cassoulet, the rabbit is so moist and tender it falls right off the bone. The beans become almost creamy. Don your best hunting gear for a trip to the butchers, then get this rabbit in the oven. 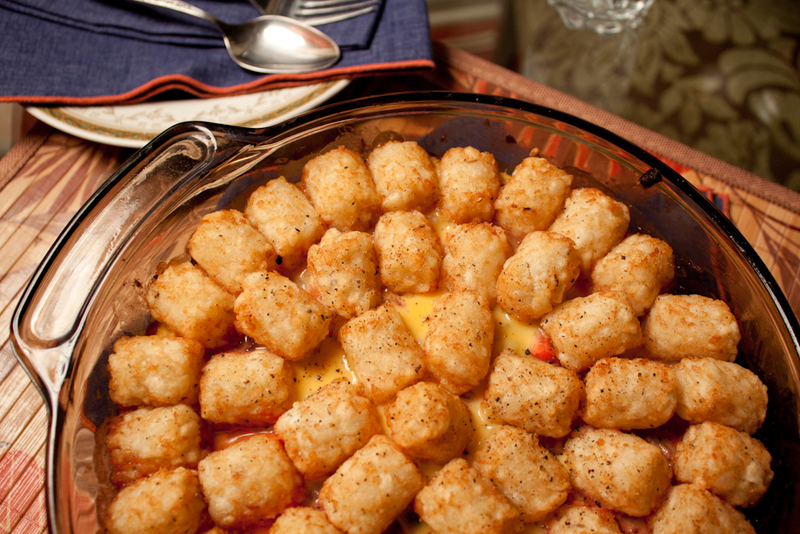 It's time for a delicious Fat and Happy fall casserole! 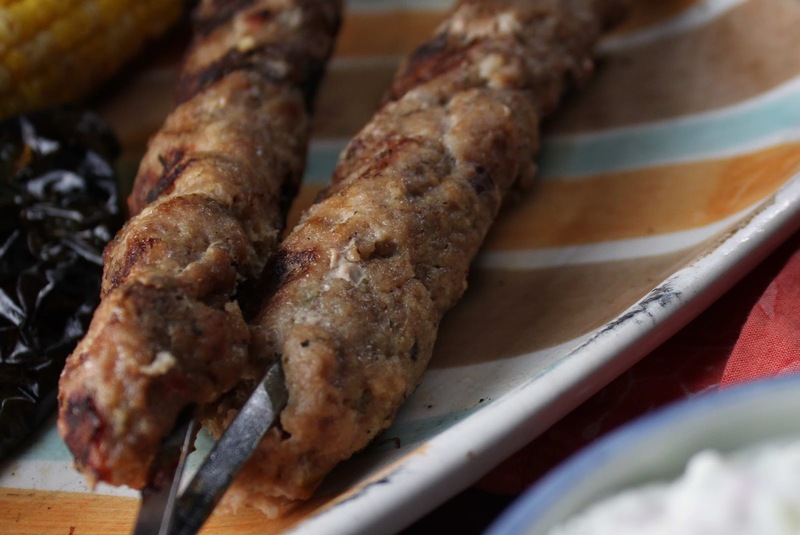 Kofta is essentially a Middle Eastern name for meatballs or meat loaf. Most often you will see this in the form of a kabob (basically meat on a stick) but made from finely ground beef or lamb and often served with a classic tzatziki sauce. Using turkey meat is not traditional but does offer a lower calorie meal. The trick with ground turkey meat is that it needs to be moistened and seasoned well, almost over-seasoned really, or it comes out dry and bland. Using the cucumber juice, hot peppers and a few chopped olives along with the olive brine helps to stave off boring, dry meat. My scaled down cucumber sauce is simple but just the right topping for the turkey. Put a slight twist on a traditional burger or meatloaf for your next casual barbecue, it's a Fat and Happy flavorful meal! This is a follow up post to the Chorizo Eggplant Tacos recipe posted earlier this month. Similar to the tacos, these burritos use fresh, organic eggplant to create a super simple, healthy dinner. The spongy eggplant texture offers an almost mild, mushroom essence that compliments the bacon and tomatoes. Fat and Happy burritos that are nutritious and delicious! I've been talking a lot about my weekly CSA delivery and rightfully so. Fresh, organic produce delivered to my doorstep direct from the farm is brilliant! However, a couple of weeks in a row of eggplants and I was running out of ideas. Then it hit me to turn them into a taco or burrito filling. Eggplant has a mild flavor and will take on the essence of its surroundings. I played with both chorizo and bacon- look for the bacon burrito posting in the next week or so. The ingredients are completely simple and without complication. Think of this as a rendition of a street taco. A simple, organic, healthy, Fat and Happy street taco. Summer brings the best flavors. Flavors that don't need to be sauteed, simmered or deep fried, just served fresh. 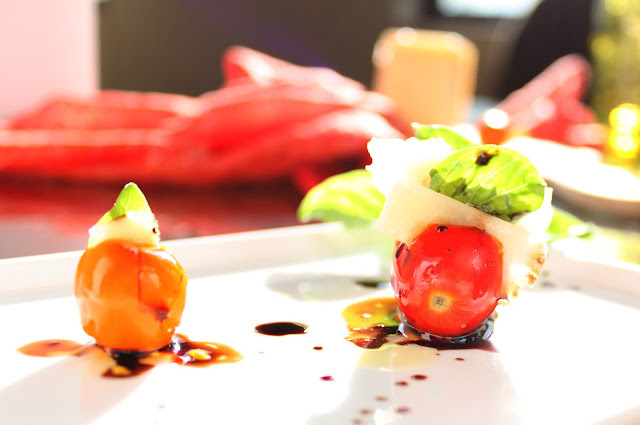 A stunning, farm-grown tomato stuffed with fresh basil and touch of Parmesan cheese topped off with a high quality olive oil and balsamic vinegar. It looks stunning and it satisfies the taste buds like nothing else. It's the Fat and Happy version of a Caprese Salad - perfect for appetizers, side dishes or a snack with a glass of wine. Fat and Happy Food Blog Tips and Techniques: You must use the best tomatoes and high quality olive oil and balsamic vinegar for the greatest result! For the smaller, cherry-size tomatoes- cut a little small slit in the shape of an 'X' in the top of the tomato, place a small basil leaf and a small hunk of Parmesan cheese in the slits. Add a few drop of olive oil and balsamic vinegar on top. For a slightly larger tomato, add two angled slices on the top of the tomato. 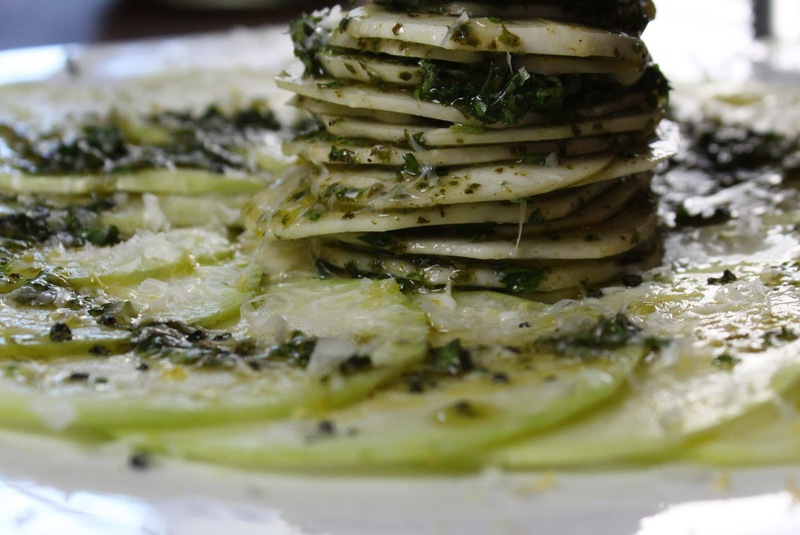 Stuff each slice with a basil leaf and a little hunk or slice of Parmesan cheese. Drizzle with olive oil and balsamic vinegar. Cravings are a funny thing - you don't know when they're going to hit or what they're going to be for. Normal cravings tend to run the gamut of chocolate to pickles and even beer; not too may people have French Toast cravings. I do and did, however, and the craving lasted weeks. There was no escaping it, French Toast was going to get made and it needed to be good. Since I like to incorporate a little alcohol into everything baked and cooked or fried, this recipe ended up with a tequila edge. 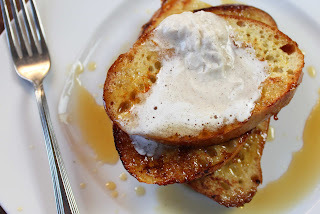 The french toast itself does not make this dish, it's the combination of the french toast, the syrup and the cream that melds together and gives this breakfast treat it's amazing allure. It's sweet and savory with a little tiny spice finish. Pair it with a classic mimosa or an orange margarita to keep the orange flavor going. And just because you're not craving it doesn't mean you shouldn't make it! Let the Fat and Happy brunch begin. Fat and Happy Food Blog Tip and Techniques: This isn't the time to pull out your expensive tequila, use a mid -range and save the good stuff for sipping. The syrup takes the longest to make, begin that first and let it simmer while you are making the toast. In a shallow bowl, mix the eggs, orange juice, tequila and allspice together with fork. Slice the bread on an angle about 2 inches thick. Heat a flat fry pan over medium high heat, use the butter to grease the pan. Lightly dip the bread into the egg mixture, don't let it soak too up too much mixture or become too wet. Cook on both sides until dark golden brown. While the french toast is cooking, whip up the spiced cream. Stack a few pieces of the french toast in the middle of a plate. Give a good drizzle of the Orange Maple Syrup and top with the Spiced Whipped Cream. Place all the ingredients into a small sauce pan, simmer until slightly reduced and thickened. Remove the jalapeno slice before serving. Whip all of the ingredients until soft peaks form. Spoon a small dollop on top of the Tequila Orange French Toast. Watermelon might be the ultimate summer fruit. Every once in a while it's nice to up the ante just a little, to add a bit of panache to your fruit. Super easy, tasty, fresh sides and salads for picnics, summer barbecues or anytime. The fact is there isn't much to say other than that. The honey adds just a touch of sweetness while the salty cheese makes the taste buds beg for more. The cooling fresh mint is just damn refreshing. Just three little ingredients give this simple fruit elegance and happiness. And that resembles Fat and Happy more than anything else. This was nearly my first Recipe Swap fail. I was convinced that I needed to create a molasses beer cookie that had an oozing ginger center. I was so close to an amazing, porter based molasses cookie with a creamy ginger center that I could almost taste it. In fact, I did taste it ... a few times. It was so close, but I just couldn't quite get the recipe where it needed to be. Imagine now that it's Sunday afternoon, just a few mere hours from when my recipe is supposed to be posted and I over tweaked my cookie recipe so much that these cookies now look like sad, flat little tortillas. So much for the puffy, gooey middle. The one downfall of receiving my CSA (Community Supported Agriculture) delivery every week is that summertime is so jam-packed with activities that it's all too easy to let my kitchen become a fresh food graveyard. Take this last week for example- between work, baseball outings, barbeque's, beach volleyball, trivia, dinner with friends, a street festival and a day long canoe trip, there wasn't time to play with the organic produce delivered to my door. The zucchini, eggplant and potatoes were all looking a little worse for the wear. It was a use them now or loose them to to the freezer for stock moment. My mind churned for recipe ideas as I cleaned off the signs of neglect. Roasting the eggplant and zucchini with the potatoes for a vegetable hash brown side dish was a easy decision, but it felt dry and in need of a sauce. The wind sent my strawberry plant peaking in the window corner as if looking longingly at the hash. Perhaps a very simply berry dressing could work, at least it was worth a shot. 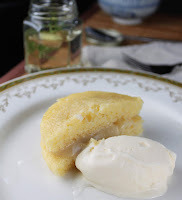 This post is the second part to the Almond Cake with Ginger Syrup post, which I blogged about previously. For whatever reason, I had it in my head that I wanted to marry ginger and grapefruit for my friends birthday cake. I did and it's a super fun mix. The moist gingery almond cake gets a kick from the subtle yet punchy grapefruit ice cream. It's an unexpected flavor from this creamy pillow. I created this recipe slightly different than my typical ice creams by combining a custard with a typical 'fool' (whipped cream) option for a lighter end product. Ice cream is always Fat and Happy, and now it's zippy too. Birthdays are special and should be celebrated as such. When I get the chance to help a friend celebrate by making their cake, my goal is to make that cake as memorable as possible. The cake should represent them, their personality and their energy. This Almond Cake was for a friend who is refined and classic with an refreshingly cool and sassy layer. The ground almonds give the elegant cake it's grainy-like texture while the ginger syrup keeps the cake mouth-wateringly moist. 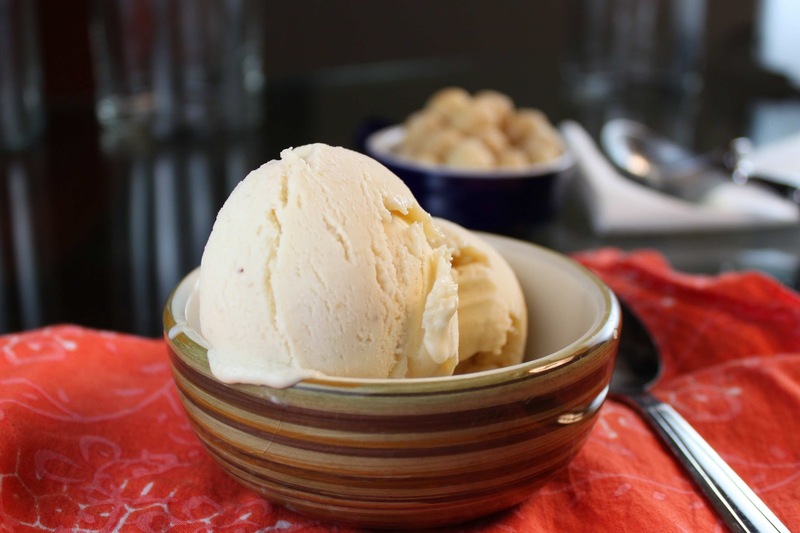 The grapefruit ice cream brings in a bold punch against the ginger. An elegant birthday cake by all standards, yet casual enough for any Fat and Happy day. It's no secret how much I'm into grilling. Yet there are times, yes even in the summer, that a slow cooked crock pot dish is the right choice. Case in point, we were hosting an evening barbecue for a friends birthday ... after an afternoon Cubs game ... in the Bleachers! How that was ever agreed to is still beyond me. The most important point of the day is that the food needed to be easy to put together with all of the work done ahead of time. 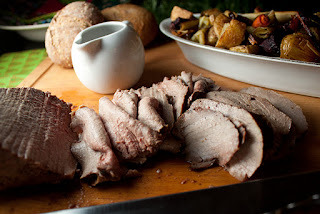 Without getting into too many details, porchetta is traditionally an Italian street food in which a pig is stuffed with herbs, roasted over a spit then sliced for sandwiches. I enjoyed this while in Amondola, Italy some years back and still crave it today. My version takes on a different form being slow cooked in the crock pot, but it's still tasty and juicy; admittedly not the original though. However adding the macadamia nut pesto to this sandwich takes it in a whole different direction. Hello, my name is Monique. It's been one week since I first made Bacon Jam and I'm addicted. I've eaten it every day for seven days straight in some way, shape or form. And now I'm going to be an amazing blog friend and share this recipe with you. Actually, the recipe is already on the blog from last weeks Homemade Bacon Roll post, but you'll find it below as well. This Bacon Jam / Jelly / Marmalade is deep, rich and dark with a hint of sweet and spice. It's divine and will change the way you think about about jam! One of my initial thoughts was how great this would taste with fresh garden tomato. 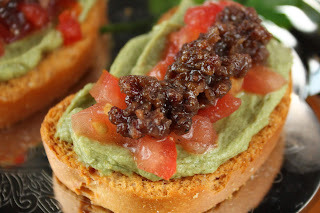 That thought led me to a BLT which ultimately brought me to this Bacon Jam, Avocado and Tomato Bruschetta. I was testing these out as an appetizer and ate so many I couldn't eat dinner! The uses for this delectable preserve are endless - spread it on a sandwich or burger, top a fresh tomato or smear it on toast and top with a sunny side up egg. Or enjoy it the Fat and Happy way - with a spoon! How many times have you had a wilted lettuce salad? You may find it interesting it's the oil, not the vinegar, that wilts the lettuce quicker. True story. Enter this cucumber lettuce salad. The butter lettuce is hardy and won't wilt under this dressing made with less oil than typical, so you can dress this salad for a buffet table and be confident it will stand up. Try this fantastic fresh, crisp summer salad next to a spicy grilled burger like this Chorizo Stuffed Burger. The citrusy vinaigrette is tasty and cooling.